One of the joys of our profession as destination wedding photographers is to travel the world looking for beautiful landscapes with which we can create our signature Couplescapes. One of our favourite places to visit is the country of Italy. 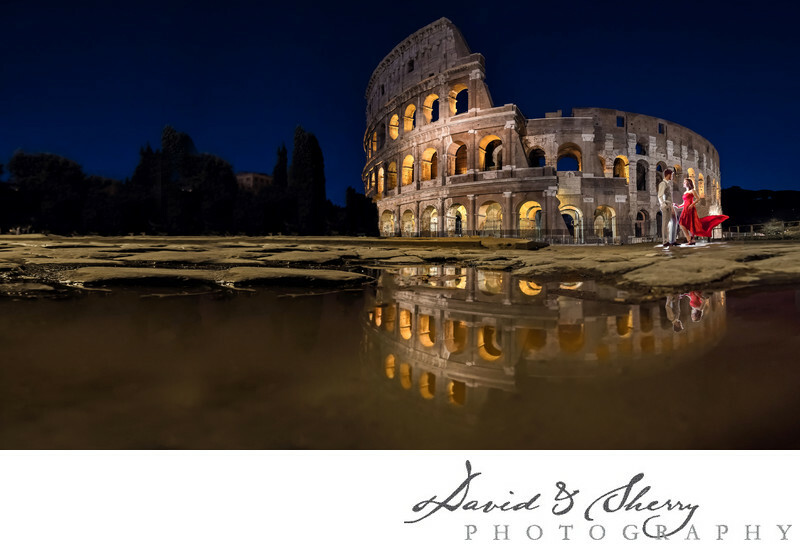 We love the ancient architecture of Rome including the Colosseum and the old streets. The aqueducts and olive groves which dot the landscape and hit of a bygone era of Roman colonization and we can create photos with our brides and grooms which combine the history with the love this new couple has together. 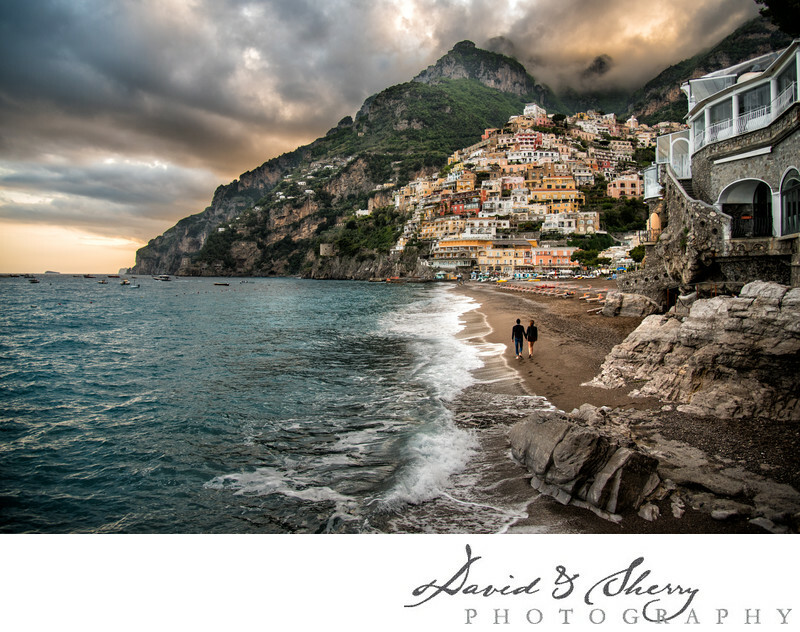 Other places we have photographed are Florence, Tuscany, San Gimignano, Petrognano, Cinque Terre, Manarola, Pisa, Portovenere, Venice, Lake Como, Lake Misurina, Amalfi Coast, and Positano. These beautiful beach locations or the uniqueness of the canal city of Venice in St. Mark’s Square give us some of the most beautiful pre-wedding or engagement photo locations in Italy. One of the longest standing major cities in the world this mecca of history and architecture boasts some of the most beautiful structures in the world. The Colosseum located in the middle of Rome was funded by the spoils of the Temple in Jerusalem after 70 AD and acted as a theatre for games during the next hundreds of years. It has since been a home, left for decay and now one of the most popular tourist locations in the world. When we have such a beautiful backdrop for such an image of an engaged couple during their destination pre-wedding photography we wait until sunset when the lighting is perfect before snapping the shutter. High fashion styled shoots with beautiful couture clothing and expensive shoes is the ticket for creating timeless photographs in a place like this. The metropolis of the region of Tuscany known as the Cradle of the Renaissance, this bustling city and it’s walking only streets, famous church Santa Maria del Fiore and bridge with all the jewelry shops Ponte Vecchio crossing the Arno provide a unique atmosphere for beautiful pictures. Our pre-wedding photo shoot ideas for this city include lots of architecture and roaming the beautiful streets while eating world famous gelato. We love capturing the romance of a couple in a location such as Firenze. The city of towers is one of our most desired places to go as the ancient streets and buildings transport you to another world. The alley ways and view of the Tuscan landscape offer a walled city feel with stone towers poking up along it's lanscape throughout the 13th century city. Along the Piazza del Cisterna in the center of town is a well and a courtyard surrounded by ancient appartments and gives a full tuscan feel to the photos. Of course it helps that Gelateria Dondoli is in the same courtyard which if you try to leave the area without eating his signature Creme of Saffron gelato you will be missing out in life. 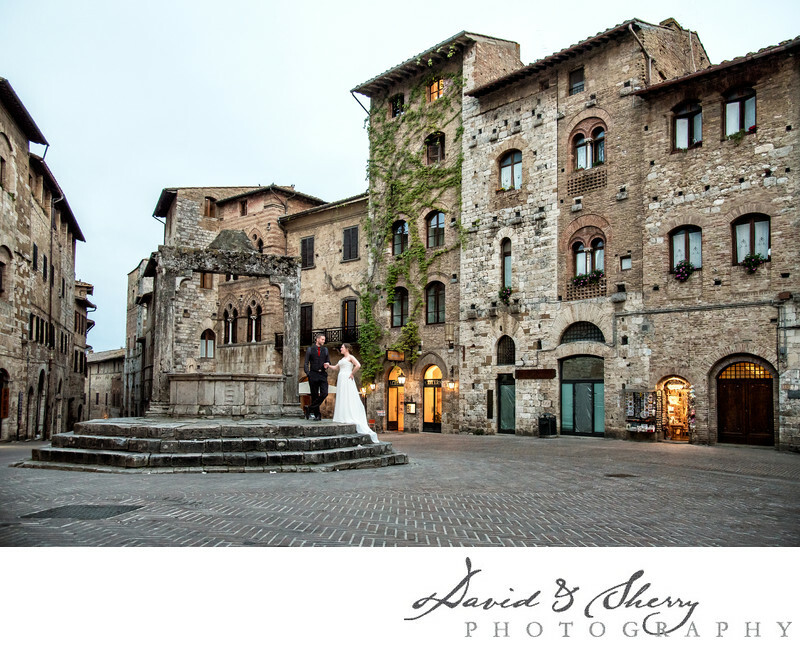 Destination engagement photography happens perfectly in this ancient city and wonderful tourist city in Tuscany. The city of Positano along the Amalfi coast which once was just a small fishing village on the Mediterranean Sea has turned into a world famous tourist attraction because of it's location and unique city design on the side of a mountain. The beach at waters edge provides for some of the most unique pre-wedding photo locations in the world. This particular photo includes a newly engaged man and is fiancee walking along the beach holding hands with the city of Positano in the background. The colourful buildings that fill the mountainside in the background and with them we create wonderful landscape style portraits for our clients to display as enlargements in their homes. How many destinations are there in the world more interesting than the city of Venice. Built in a lagoon the streets aren't streets at all but rather canals where boats and water taxis ferry tourists around the town to and from St. Mark's Square and everywhere you turn there is an interesting alley, an espresso shop, a bridge crossing the canal and a view of the centuries old buildings that line the canals. We find by bringing studio lighting on location and carrying with us the best camera gear, lenses and cameras we can pose our clients in such a way as to portray the masked city in a high fashion way. We love to include the natural emotion the couple has along with magazine style posing and facial expressions to create a dynamic mix of well composed images. Snuggled up to the Mediterranean Sea along the Italian Riviera, the cities of Monterosso al Mare, Vernazza, Corniglia, Manarola, and Riomaggiore west of La Spezia and Portovenere these small fishing villages are similar in design to Positano and offer a walking path in between the cities offering stunning views. We love the lookouts in Manarola and the park in the middle of the city as it is found nowhere else in the world. 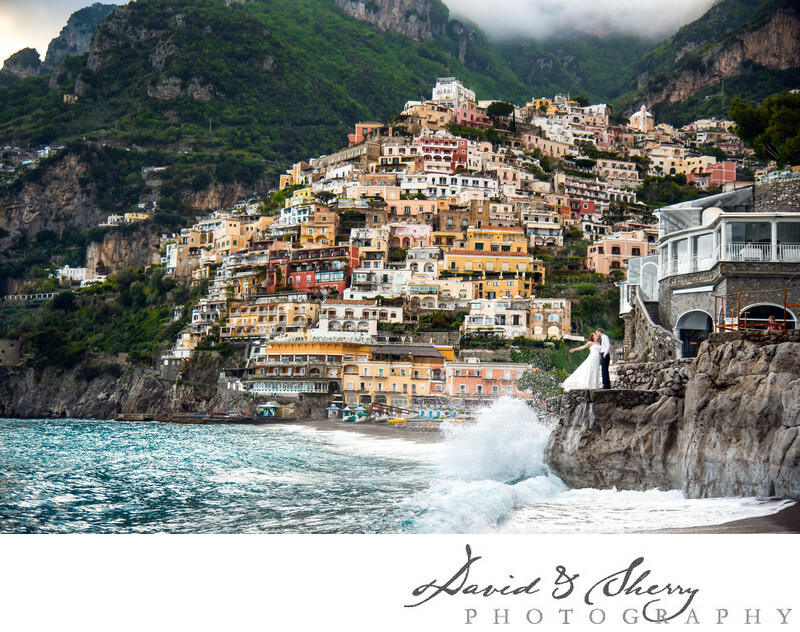 Come join us on a special destination pre-wedding photo trip to Cinque Terre.